2.5 to 3 lb chuck roast (preferably Angus or other nice cut). Look for marbling...this will ensure tenderness. Baby carrots, about 1.5 dozen. Good (not great) dry red wine...quantity varies...maybe a cup and a half or more! The more you put in the roast, the less you drink while it is cooking. Fry bacon to crisp in heavy skillet. Remove and save for later. Have a couple while you are doing the rest of this recipe. Really good. DON'T discard the bacon drippings! 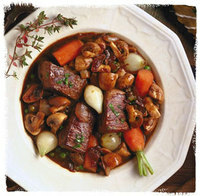 Cut roast into 1 to 2 inch cubes more or less (remove excess fat). Season with whatever you like and dust with flour. I use a garlic/parsley based seasoning. Brown roast cubes in bacon drippings left in the pan. About 2 minutes a side on medium heat. Remove roast cubes and set aside. De-glaze pan with a little beef broth, water or wine (yum) over medium heat. Add two (2) more cans of beef broth. Add roast cubes to pan (this is the same pan that had the bacon, I hope ... grease and all, trust me, you'll like it). Coarsely chop two large cloves of garlic and add to pan. Salt and pepper to taste (not too much, not too little). I add a little sea salt, a few cloves (whole) of white and black pepper. Add the other seasonings mentioned above sparingly. Only add one (1) tablespoon of tomato paste! Any more and the result will taste and look like spaghetti sauce. Add about a cup to 1 1/2 cups of the red wine. Don't over fill the roasting pan like I usually do and make a mess. Bring to a simmer over medium low heat. Oh...I forgot: Preheat oven to 350 degrees F. Geeeez...sometimes I forget this. Doesn't matter. We can wait for it. Cover pan. You need a heavy pan that can be covered and placed into a hot oven! Set the temperature to about 325 degrees. You never want the roast in all the wonderful liquids and seasonings to boil. Just simmer. Simmer is just bubbling a little bit. Simmer for at least 2 1/2 hours. So, watch it for the first 15 minutes or so. When it starts to boil, turn the heat down. I usually can cook this at 250 to 275 degrees for about 2 to 3 hours or until the roast is tender. Slow cooking is good. Don't rush it. Saute the Pearl Onions and Baby Carrots. Maybe 10 minutes in a shallow pan with a little water. Set aside. Boil the red potatoes to ALMOST done. Set aside. Wash and cut mushrooms (not too small). Set aside. Now, everything is ready for the roast to appear! When roast is done (per your own judgment), remove from oven and add cooked ready vegetables (don't forget the bacon...crumbled). If you need more liquid, add beef broth or better yet, more wine. Not too much though. Re-simmer if necessary. If you don't have enough room for everything in the pan, add everything but the potatoes. Those can be added to the serving plates. Don't forget to be generous with the liquids. We do bowls along with some great french bread for dipping. Not quite done. For this dinner one night, I selected a 1982 Chateau Margaux Bordeaux (obviously french) to accompany this home recipe. I wasn't disappointed. Smooth, dry, good fruit balance and acidity/tannin balance. Gentlemen: Fix this for the one you love or want to love...it is really easy and will place you in a class a cut above the rest. Trust me on this. Call if you want help. CAUTION: DO NOT USE FINE WINE IN THE ROAST. SAVE IT FOR DRINKING!